There are seven days, 168 hours or more than 10,000 minutes in a week. If you're like a lot of parents, almost every one of them is already spoken for. It can be incredibly difficult to find time for fitness. The YMCA of Southern Nevada is here to help. Each of our four locations are open seven days a week. We offer childcare services, so your children can play in a fun, safe environment while you get your workout in. You'll find state-of-the-art workout equipment, and the free weights are plentiful. But, working out is the easy part. It's finding time for both family and fitness that is difficult. Kids are always welcome at the Y. If they are old enough, your kids can work out with you. If they are younger, they are sure to love all the supervised activities our childcare provides. This gets them involved while allowing you to exercise. 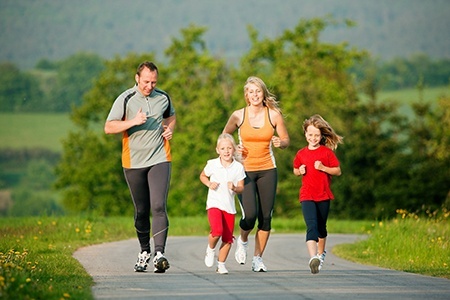 Working out early in the morning is a great way to get your exercise in without taking time away from the family. All four Las Vegas facilities open at either 5 or 6 a.m. during the work week. That means you can work out before the sun comes up – and you'll be back home before the kids are awake. Treadmills, ellipticals and stationary bikes aren't the only ways to work out. You can also go for walks, hikes and bike rides, all of which offer outstanding opportunities for you to connect with your kids while exercising. The Y offers an array of outdoor activities for every member of your family. If you're having trouble finding time to work out because you're always running your kids around town for practice and play dates, why not run them to the Y? They'll be able to enjoy various classes, courses and activities for all ages. Signing your kids up for a class at the Y gives you a reason to stick around and workout. If you are the type of person who goes from meeting to meeting all day long, begin thinking of your fitness routine as a meeting. People are always meeting at the Y to take advantage of exercise classes. So, sign up, add it to the calendar, and then, make sure you don't miss a single one. By getting the family involved, you'll be able to make time for fitness – time both you and your children will look forward to. For more information on the various classes, courses and family activities offered at the Y, contact us or visit one of our four locations today!